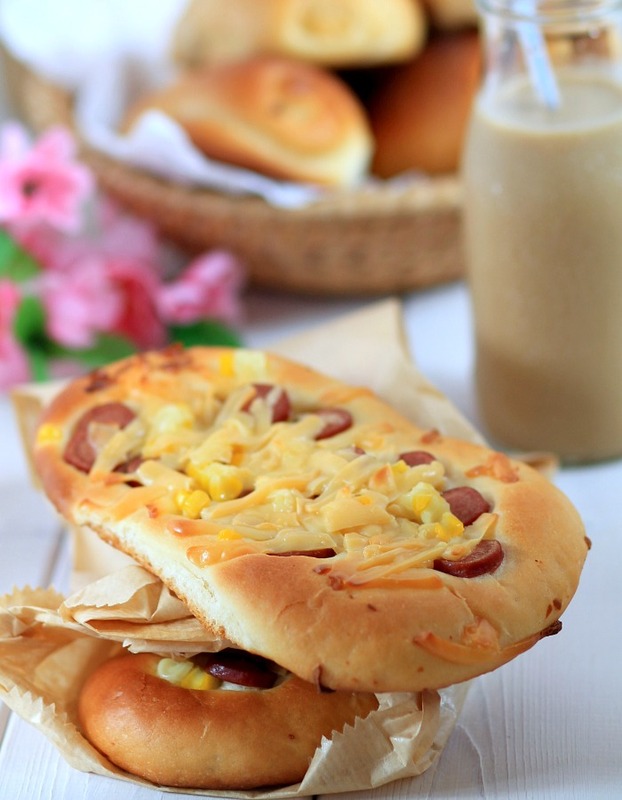 my bare cupboard: Chicken sausage , corn and cheese bread/rolls ( $ 5000 bread recipe ) "
I was thinking of posting this recipe for quiet sometime . This is actually my 3rd time using the same recipe , the same one that some blogging friends is raving about more than a month ago . Nobody can't resist a soft and pillow-y bread and this bread lives up to its hype ! Why the name $ 5000 bread or maybe it's renminbi instead of a dollar ?! According to Victoria , the sifu/chef/master spent a staggering amount of money , 5000 yuan/renminbi to be exact , to find ways how to make the perfect bread texture , to suit some Asian palate , perhaps ? What's the perfect bread texture anyway ? Don't know , as long as it's soft as a pillow and delicious , I'm sold ! The story seems so far fetched , right ?! Imagine using that much money in developing one bread recipe alone but it's one great conversation starters . Why make it thrice with the same recipe ?! It was that good ! Since I'm one of those who love filled breads , the first time I've made the bread , I filled it with some orange-lime curd but not too happy with the boring photos and there were some blisters on top , over-mixed dough or long proving , perhaps ? But the texture and the addition of my homemade curd was so wonderful that I told myself , just make it again next time . Well , the second time , I used ham turkey and cheese filling but I was just too lazy to take photos . This time because I need to post something so I made these sort-of pizza bread and rolls . The former is not as fluffy as the latter but still got a nice texture , I think this recipe , no matter what you'll do with it , it will still yield a wonderful result that will suit everyone , that is , if you dig Asian-style soft bread . Some tips : You can use all-purpose flour instead of bread flour in this recipe . If the size of the egg you're using is small and less than the amount called for in this recipe , instead of using another egg , you can add milk or cream or water instead . If you bake it as a loaf and using the counter top oven , place the pan at the lowest rack and keep an eye on the top part esp if using all-purpose flour , it'll turn light brown rapidly in less than 5 minutes , wait for another 5 minutes to open the oven and tent the the top with foil . * Combine starter in a mixing bowl , use a spatula or a wooden spoon and mix until well combined , about a minute . Cover with plastic wrap and let rise for 3 hours at room temperature . Or you can prepare the starter overnight , mix the ingredients as usual , cover with plastic wrap and leave to rise for 30 minutes at room temperature then place in the fridge overnight . Take out from the fridge an hour before using . * Add the main dough ingredients except the butter to the starter , mix until it forms a cohesive dough then tip dough into the work surface . Knead for 3 to 4 minutes , the dough will be sticky , stretch the dough into a rough circle or square , about 6-inch , then scatter butter on top , fold dough . Knead until butter is thoroughly incorporated into the dough , use a plastic scraper to help gather the dough as the dough is sticky yet silky , continue kneading or use a slap and fold method until dough is smooth and elastic , about 15 minutes . Place dough into a lightly-greased bowl , turn once to coat then cover with plastic wrap , let rise in a warm place until tripled in size . * Tip dough into the work surface , knead , stretch and fold for a minute , then divide dough into 10 pieces , my final dough is 590 grams ( you can shape it according to preference , please click the recipe link for some different bread shapes ) , let rest for 5 minutes , covered with plastic wrap or a tea towel . For the sort-of pizza bread , roll 1 portion into 6 by about 3 1/2-inch rough rectangle , scatter some sausage slices , corn kernels and cheese on top , transfer into a lightly-grease baking sheets and cover with plastic wrap/tea towel , repeat with the rest . Or shape the dough then into the baking sheet and put the toppings right there , easier than transferring each piece with toppings . For the rolls , roll 1 portion of the dough into 9 by 2 1/2 -inch , scatter toppings on top , starting on the short side , roll dough and gently pinch the end , transfer to a lightly-greased baking sheet then repeat with the rest . Let rise in a warm place until doubled in size . * 1 hour before baking , preheat oven to 180°C . Bake for 23 minutes ( internal temperature is 190°F ) . If baking a loaf bread , bake for 30 to 35 minutes . Transfer to a wire rack , brush top of the rolls with softened butter and let rest for few minutes before attacking it . Wait for me, i am coming for breakfast ;-) I read about this recipe too but have been lazy, too lazy in fact since you have already attempted it thrice! I have seen many bloggers fried this recipe, but every time when I want to make, and realized it requires overnight sponge. So have to really plan a day to make this. 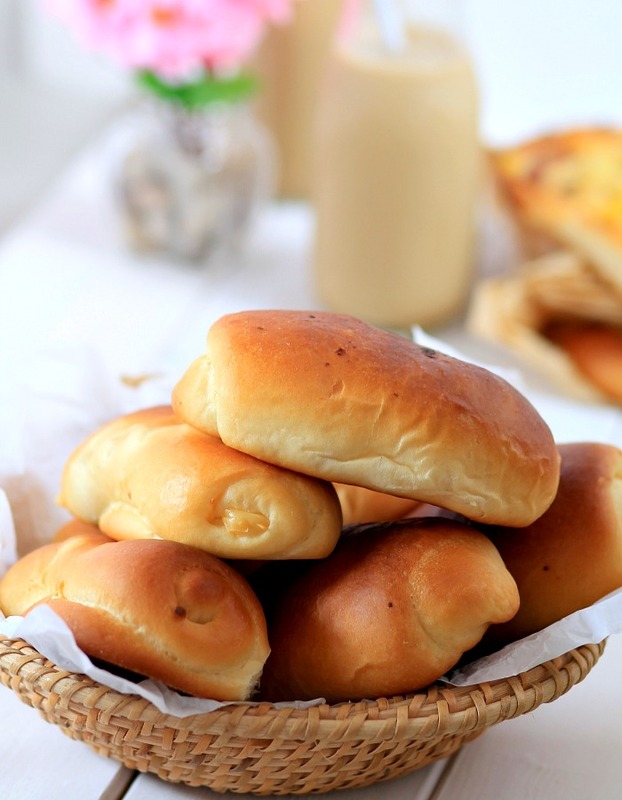 Hi Anne, I saw this popular 5K bread recipe at Victoria's blog and is very popular on FB. I like the fillings you added, sound so delicious and the bread looks so soft and fluffy. Heard a lot about this bread too, Anne! It looks really soft and fluffy. You know that I have a weakness for the homemade bread. These look awesome, Anne. Well done, very professional and excellent photography skill. Wow. I am seriously drooling over this! This looks so good! the texture looks indeed very impressive! this five thousand bread recipe is really popular, i like that the fact that the starter can be left to rise overnight in the fridge!